Do you have the feeling that things aren't right with your website, but aren't sure if it's been hacked? If so, I've got a resource for you. Sucuri offers a free tool that scans your website for malware. It also checks to see if your site has been blacklisted and does a preliminary check for out of date software. If you have a WordPress site, you'll want to check out their free security plugin. I highly recommend it! Is your WordPress website running on old software? Are you afraid that your site will be hacked, but even more concerned that something will break if you try and update it yourself? I can help! I offer an affordable, comprehensive update service. You can learn more here. Am I Taking New Clients? People often ask me if they can mention my services to a friend or colleague. I'd be delighted! The fact that you like my services enough to recommend me to others means so much to me! Are you thinking about adding a newsletter to your site? There are a lot of services to chose from. I've worked with Constant Contact, aWeber, 1ShoppingCart.com, MailChimp, phpList and others. Contact me and I'll help you figure out the option that best meets your needs. In one-on-one WordPress coaching sessions I’ve seen how delighted people are when they learn how to take care of their own websites. I wanted to find a way to help even more people with WordPress. So I decided to write a book. 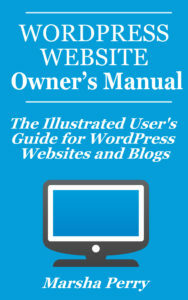 The WordPress Website Owner’s Manual: The Illustrated User’s Guide for WordPress Websites and Blogs goes over the items contained in my WordPress coaching sessions. It has information on updating WordPress, picking out plugins and a lot more. Do you know someone who could use the information in this newsletter? Invite them to sign up! They'll get a monthly email with news and tips for website owners. They'll also receive a free copy of my WordPress Tips & Update Guide.